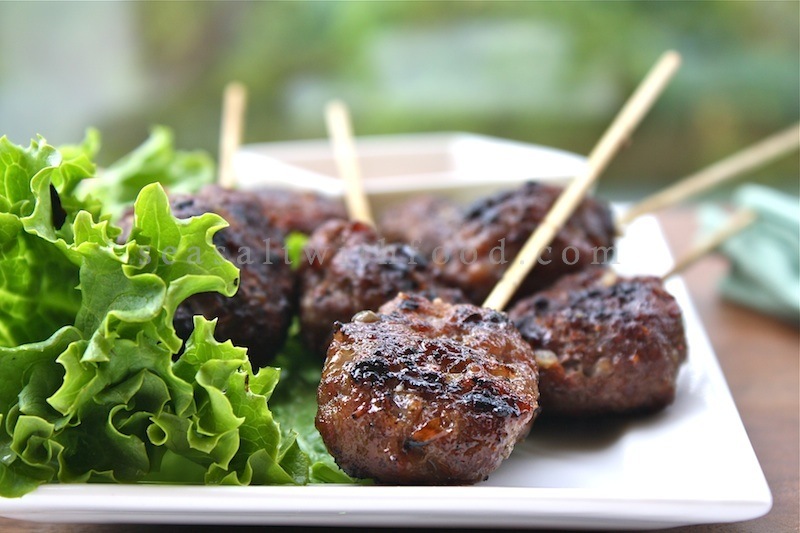 This is a fantastic Vietnamese inspired Grilled Meat Pops recipe. You can use either ground pork or beef for this recipe. The meat pops are full of flavors from the combination of lemongrass, galangal, shallots, chili flakes, garlic, fish sauce, sugar, and sea salt. I marinated the meat for about 2 hours. Then, I gently shape them into oval shape patties and pierced into the skewers. Lightly brush the meat patties with some oil before grilling. 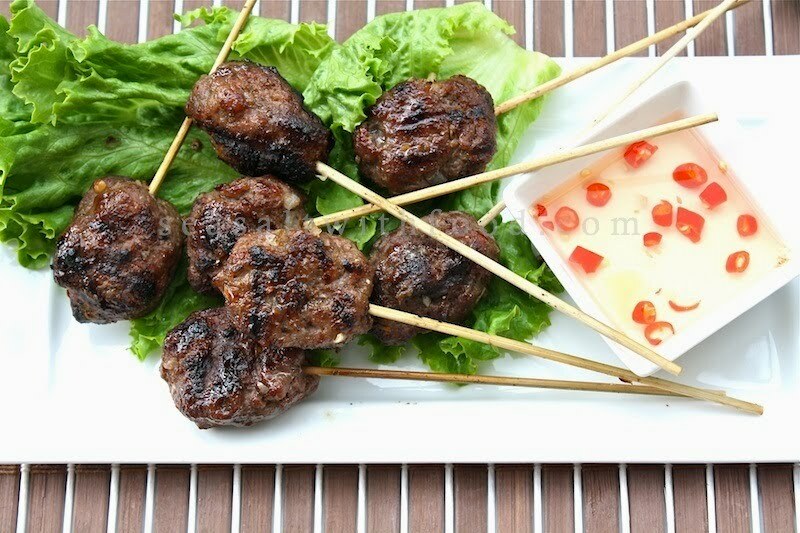 Serve the meat pops with some Vietnamese Chili Lime Sauce. Combine the ground meat, shallots, garlic, galangal, lemongrass, chili flakes, sugar, fish sauce, and sea salt in a bowl. Refrigerate the meat mixture for about 2 hours. Light up the charcoal or prepare the gas grill for direct cooking over high heat. Using your moistened hands, shape the meat mixture into oval (about 1 ½ to 2 Tbsp of meat) shape patty. Place each pops on the end of a skewer. Brush the pops lightly with oil. Grill the meat pops until they are fully cooked. Serve warm with Vietnamese Chili Lime Sauce. How much meat do you use? @Anonymous: Oops! It's 500 g. Thanks. Heh, but my husband doesn't eat pork or beef, or any red meat. Looks delicious. I'm definitely going to try this as I love Vietnamese food. Looks so so yummy delicous, I am sure gonna make this once but have to do in the ovezn though. Is the mixture very cohesive? This looks delicious, but I don't see how it stays in shape on the stick. That is a great and fun way to serve meat! On a little stick. Thanks for your inspiration! Congrats on being #7 in todays top 9. 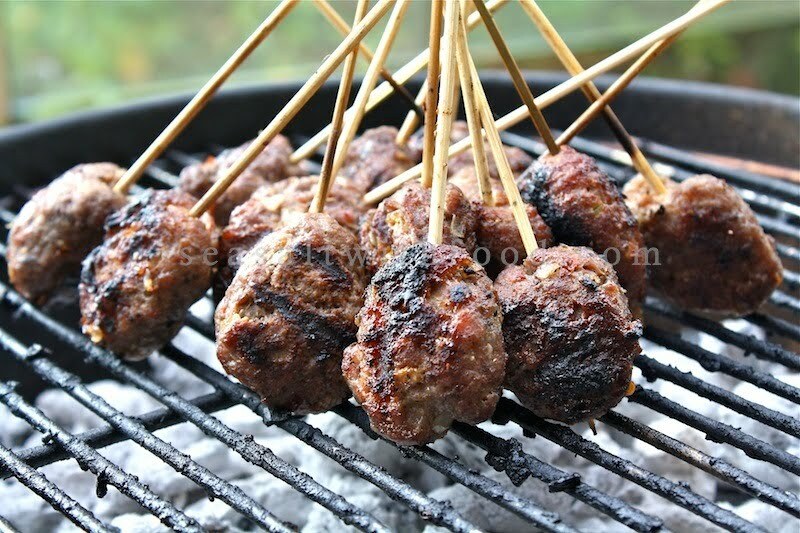 @Shelle: The meat mixture has the right consistency to hold its shape on the stick. @Oshawa: Thanks. Those "MOINKs" looks good! This looks absolutely delish! Great post! Angie, your dishes make my mouth water! Beautiful. Just found you and so glad I did. I grew up in Hawaii and have a deep love and appreciation for the flavors of Asia. Will visit your site often! Beautiful photography, too.